Nicholas C. Dowling was sworn in as a probationary police officer in Deal last week after previously serving as a special officer and dispatcher. Dowling, 25, has a Bachelor’s of Science degree from Jersey City University with a minor in professional security. He also has an Associates Degree in criminal justice from Brookdale Community College. 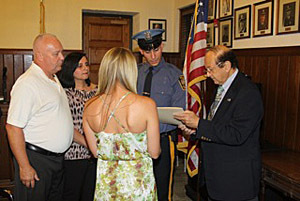 He is a graduate of Ocean Township High School and is a volunteer with the Wanamassa Fire Department.